The youth and ICT industry and education leaders are concerned about the slow adoption of STEM subjects in schools. That was the main message raised across a panel of speakers at the Data61 2016 conference. A key part of the discussion surrounded classroom learning and the discrepancies between the classroom curriculum and industry or real world application. Canberra Girls Year 12 student, Laura Johnston, said from her own experience, many students do not see the practical aspect of choosing to continue STEM subjects through their senior years. “One of the ways to combat this, is to show real world applications and show that there are more ways to use these skills later in life,” Johnston said. “It’s in space club or coding club where the interesting stuff is done. That’s where we start to discover where you can apply these critical skills to potentially find solutions to the problems of the world. Why is this interesting teaching happening in the clubs and not in the classroom? We seem to have this dichotomy of sticking to a very rigid curriculum in the classroom and doing all the cool stuff in the club,” she continued. 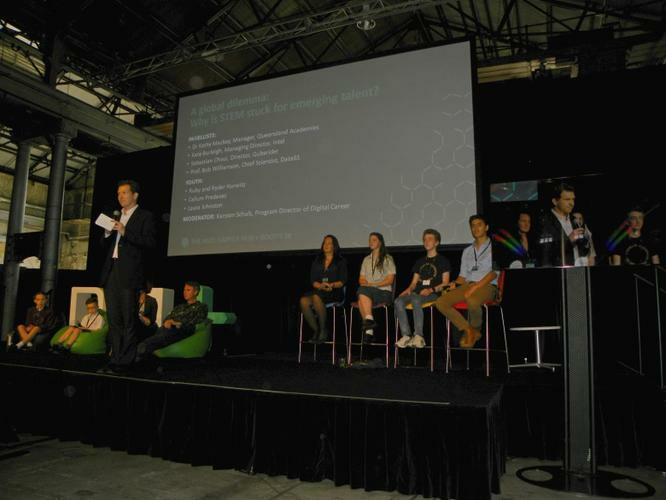 Quberider director, Sebastian Choui, a key panellist, explained how the Quberider start-up program is designed to re-invigorate STEM learning within schools through practical, project-based learning. Choui expressed how the program caters to different learning styles as some children might be interesting in designing the experiment versus the children who are interested in the actual coding of the experiment. “We let school children send their own experiments to the international space station. They control the sensors and the types of data they get to disprove or prove hypotheses. We are not only teaching kids about space science, we are teaching them about STEM, design thinking and critical thinking, as these are the key aspects for students to start understanding what STEM is actually about,” he said. Another key focus of the discussion was ATAR optimisation and how this affects students decisions in uptaking STEM or continuing STEM through to senior years. Johnston said that for many kids playing for the best ATAR score, it is simply smarter to choose humanities-based subjects as more often that not, STEM subjects are more difficult and therefore require more study. Queensland Academy manager for science, mathematics and technology, Kathryn Mackey, spoke about how part of the problem is thinking about STEM rigidly. Read more ​How sustainable are the tech industry’s hot jobs? “It is a false dichotomy that you are a maths and science stream person versus not. Rather than seeing strengths in one particular area versus another, we need to think as a team unit and the communication aspects of STEM and other associated disciplines, like science journalism,” she added. What are the most critical skills young Australians will need for jobs of the future?